I can’t think of anything more terrifying than going through the ice. Once I walked on lake ice that was bending and undulating under us. Made a pact that if God didn’t kill me that day, I’d never walk on thin ice again! Great chart, thanks. Ice is nothing to mess around with. 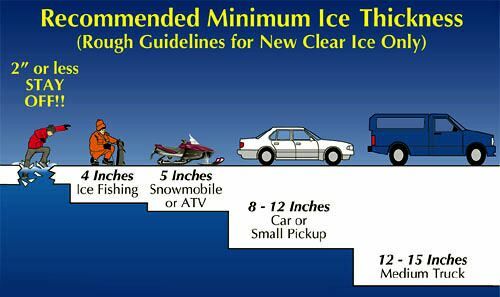 Being prepared is the only way to help ease a small portion of the thought of thin ice. Glad you find this helpful! Tight lines! I have fallen through. Years ago I went through on a pond. I had to walk a couple miles through the woods to my house. My clothes & boots were frozen solid when I got there. Since then I never go into the backwoods without a sure way to start a fire, wet or dry. It is scary business! Better to be prepared than anything. Mental preparation is the hardest part!